Everyone says that Lily is too loud. At home, her family tell her that she sings too loudly, she laughs too loudly and she even dances too loudly! At school, her loud voice gets her friends into trouble. She tries her best to be quiet, but she really can’t help it! One day, a new teacher, Miss Loopiola, comes to school to teach music and drama. She shows Lily the perfect time and place to use her talent of being loud. Too Loud Lily helps teach children about being aware of the volume of their voice and changing it to suit their surroundings. 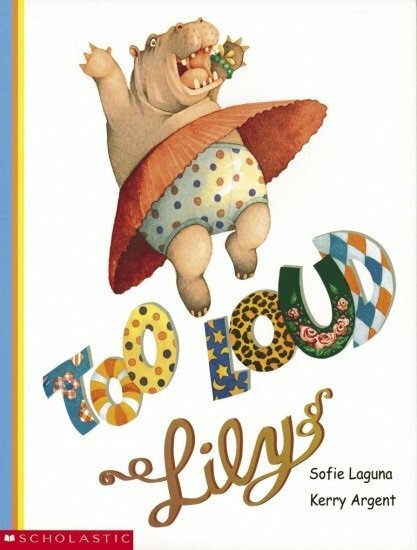 The pictures lend themselves nicely to making inferences, such as ‘Why were her friends mad at her?’ and ‘How did Lily get her friends get into trouble?’ This is also a great book to teach verbs. There are lots of verbs to copy, such as singing, stomping, clapping and growling. See below for further speech and language targets in Too Loud Lily.